Hello, welcome to my website. 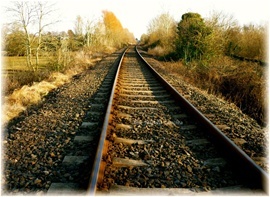 I have put together a collection of photos from Corbally, some old, some new. Take a walk through my collection and stay a while or come back often and visit, who knows what new photos you might see. If you enjoyed browsing through my website, I would be most grateful if you would click the little red heart. Rosaleen Lysaght, children Ann and Pat, St. Thomas's Island 1947. I was first introduced to the Mill Road when I was about 3 years old by my parents, they had a great love for Corbally, they spent a great deal of their teenage years in the late 1930’s swimming and boating on the river Shannon and picnicking on St. Thomas’s Island. Their dream was to one day live on the Mill Road. In the late 1940s their dream partly came true when my father acquired a very small plot of land on the edge of the Shannon at the end of the Mill Road, where he built a hut, our Summer Residence, next to his uncle Arthur who had one of the first huts in Corbally. 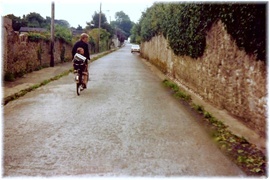 On weekends and Summer holidays we would cycle out to the Mill Road, me in a basket on the carrier of my Mam’s bike, my brother Pat on the bar of my Dad’s and our Irish terrier dog “Ginger” running along behind. During those few years, my Dad along with other hut owners organised and participated in local Regattas, winning many races. 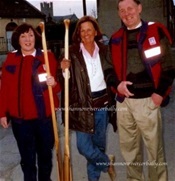 The Regattas were abandoned for years but were revived again in the 1970s, my brother Pat then became involved and won many races mostly with Dan Gallagher. How Mill Road looked in 1984 before Siúl na hAbhann and Silverbrook housing estates. 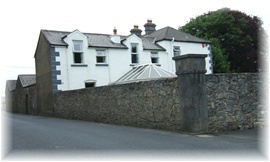 Mr. Liam Forde lived inside the high ivy clad wall on the right, up a long avenue in "Lax Weir Cottage" The wall started to be demolished on 14th December 2001 to make way for Siúl na hAbhann. On left was Maurer's field now Silverbrook estate. Marie Lysaght on her bike bringing her youngest daughter Maria to her first day at school. Opportunity knocked for my parents in the 1950’s when a small house with a bit of land came up for sale. That was it, we moved to the Mill Road permanently and haven’t moved out since. It was heaven living near the river we all loved so much. A few years later Dad built a new bungalow in the garden and we moved in there to live, Pat who wasn’t long married at the time moved into the old house, I left the Mill Road briefly when I got married but when my Dad built a new house by the river in place of the hut and moved there to live, we got the opportunity to buy their house, it was a dream come true. Later Dad built a house for my sister Rosaleen at the river next to theirs and later again for my sister Maura next to that. I think I can safely say that we loved living on the Mill Road back in those times, it was so very different to now. No housing estates, no Scoil Ide, no speed ramps, no speed signs, no double or single yellow lines. The road was quiet, quaint and narrow with plenty of lush green fields, high limestone grey walls and magnificent towering trees. There was approx. 40 houses, almost all with their own names, no numbers and we knew who lived in every house. Our next door neighbours were the Quillinans, a field away. On our way from school after hopping off the bus at the top of the Mill Road, the first house name we would see was “Sunnyside" then “India Ville”, “St. 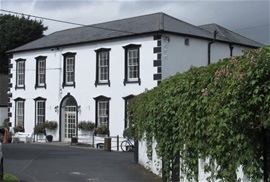 Jude’s” Nursing Home, “The Cottage”, "Geraldine", "Woodlands", "Riverview", "Maryville", "Ard na Greina", "Roseneath", "Prospect Villa", "Kilroy", “Thornville”, “Mayfield”, “Prague”, "Cúlruad" “Ruanard”, "Norwood", "Myrtle Lodge", "Hillside", "Laurel Cottage", "Laurel Ville", "Lax Weir Cottage", "Cois Abhainn", "Corbally House", "Beech Grove" and "Willow Bank Cottage". Some of the houses are now gone others have changed names. On our arrival home from school we would change our clothes, meet up with our pals who were the Connollys, Kerrs, Coughlans, Greens, Moloneys, Tullys and Kellys, then our adventures would begin, we had the run of the entire Mill Road, we knew every field, ditch, tree and blade of grass, we were familiar with pheasants, birds, rabbits, hares, hedgehogs, foxes and there was always cattle in the fields. Each season brought different pastimes. 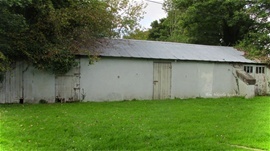 The old stables in the grounds of St. Munchin's College. In Winter we spent a lot of our time in the Bishop’s fields, now St. Munchin's College, my friend Joy Kerr kept her 2 ponies Trody and Tanzy in the stables there. We loved taking the ponies for a trot down the Mill Road, then going back into the narrow tunnel-like avenue, almost dark from the huge overhanging chestnut trees that lined the Bishop’s Avenue and then out into the open fields for a gallop right up to “Sunnyside”, then back to groom and feed the ponies and clean out the stables in the walled in stable yard. At that time there was no St. Munchin’s College, no Scoil Ide and no football pitches. Inside the Bishop’s there was also another walled in area, it was the garden of the Bishop’s Palace, there Mr. John Lyons who lived in the Gate Lodge at the main entrance kept a magnificent fruit and vegetable garden. 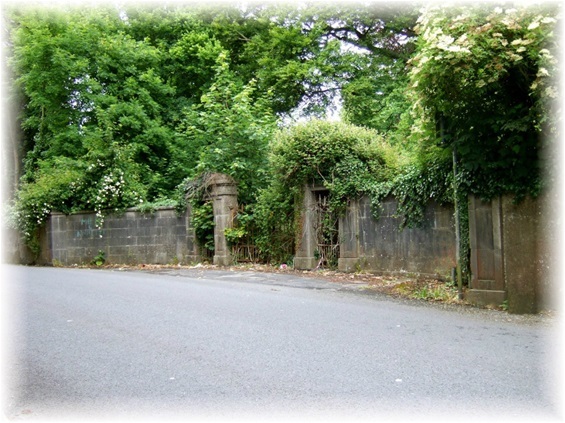 Main entrance gate to the Bishop's Palace, Mr. John Lyons lived in the gate lodge just inside the small gate on the left. The lodge is long gone, but In Summer, Mr. Lyons white roses can still be seen hanging over the wall. Another pastime of ours was to climb the very tall narrow palm trees that were just inside the entrance gate of “Prospect Villa” we called it "The Priests", Fr. Lane, Fr. Looby and Fr. Breen lived there. We would sit at the very top of the trees for hours on end watching the comings and goings of the Priests and the residents of the Mill Road, without they ever knowing, what’s more we had a spectacular view of the city. Later in 1965 “Prospect Villa” became home to The Little Sisters of the Assumption. The next owners renamed the house “Ryanhart”. Every so often we would go to spare ground in Ruddock’s of “Corbally House”, they processed films for all the Chemists in town. Just inside the front gate, there was a tunnel which led to under the front door, we made lots of attempts to venture into the tunnel, but always chickened out, feeling there might be bats inside. However, on one occasion we got the courage and went into the tunnel, feeling our way and talking as we went along, it was pitch, pitch dark, finally we came to an end and a door opened, we got the fright of our lives, and ran out, way quicker than we went in, after that we had no desire to go back there again. We discovered afterwards that the tunnel led to the cellar where the girls worked processing the films. Ruddocks were a Quaker family, their son Jack drowned at Corbally in June 1941 and is buried in the Quakers graveyard in Limerick. BROCHURE FOR KING JOHN'S HOTEL. Now Corbally House Nursing Home. 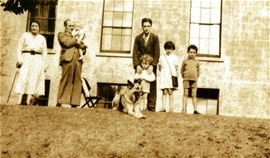 Seymour Major was the next owner of “Corbally House”, he turned it into a small hotel and named it “King John’s”, described as set in two acres of walled gardens on the banks of the River Shannon. It had H and C in all bedrooms. Tariff per person: High Season the weekly rate including breakfast, lunch and dinner £18.50, Bed & Breakfast £1.70, Luncheon £0.80, Morning Tea £0.08. Low Season weekly rate £14.00, Daily Rate £2.30, Special terms for children under 12 years of age. 10% service charge. You are sure of superb and plentiful cuisine and a warm welcome at King John's, set in two secluded acres of walled gardens at Corbally, Limerick. Though a mere five minutes drive from the centre of the city the prospect from this converted 18th century mansion is of green fields and trees with the river forming the northern boundary of the grounds. At this point the river affords wonderful salmon and trout fishing. Boats are available for hire on the river which is studded with islands ideal for exploring and picnics. On one of these islands is the ruin of an old abbey that King John granted the right to fish the adjoining waters in perpetuity. The fishing here remains free to this day. There is a swimming pool nearby and an abundance of golf courses within easy reach. Corbally Swimming Pool is only four minutes walk along the river bank from King John's. Swimming from the islands on the river is also popular. Quiet beaches are also within easy reach. Never a dull moment, we would plod through swampy fields at the back of the larger houses, the difficult way to get to the Salmon Weir bank or railway track, we swam and boated and without fear, we threaded barefoot in the river and sometimes got a peep into the hidden world beneath the carved out river rocks, other times we gathered conkers, picked mushrooms, wildflowers and blackberries, all according to the season. There was no shortage of milk or eggs, they could be purchased from Kellys now “Meadow Brook” O’Donnell’s and Healy’s farms, apples and pears from McInerneys of “Ard na Greine", hen eggs and duck eggs, milk, apples and pears from Egan’s of “Myrtle Lodge” now “Brookhaven Walk”. Inside Egan’s large gate in early Spring, the farm became a carpet of blue from the masses of bluebells, outside the gate was quite different, it was always covered in cows manure from the cows twice daily crossing into the Pool fields, now “Springrove”, it was a case of tip toeing carefully or slip, if cycling it was advisable to get off the bike or risk falling off. Monica Coughlan of "Thornville" had a small shop in her home for a short while, what I remember most about it was her delicious homemade jam. That was a time when life was a lot more relaxed and the pace not quite so hectic. Who would have dreamt that in a short few years there would be 7 housing estates on the Mill Road, in spite of that it’s still lovely to walk by the riverside and is still one of the most beautiful places in Limerick., Today, Pat, Maura, Rosaleen and I still live on the Mill Road just a few minutes walk away from each other. Lovely website Ann, thanks for the memories. This is a brilliant local site, beautifully put together, thank you for sharing. What a great site, well done. Saw the photographs of birds at the site of the Corbally Baths. Lovely to see local photographs of birds - unfortunately the names are wrong! Blair, saw the photos of the birds at the Pool yesterday, most of the photos are from my website,a few are not, and the birds incorrectly named is not my doing. Really enjoyable browsing through your site! Thanks so much! Thank you John, always nice to hear from the U.S.